Phillip and Rashida tied the knot surrounded by family and friends during their glitz and gold themed autumn wedding. The couple grew up together as next door neighbors in Brooklyn, but didn’t start dating until years later and got engaged in October 2017. Their getting ready and first look photos were taken on the rooftop of the hotel overlooking the city’s skyline. The ceremony, cocktail and reception were held at the venue, Renaissance Event Hall. During the ceremony, “Perfect” (by Ed Sheeran feat. Beyoncé) played as the bridal party processed down the aisle followed by the couple reciting their own vows. Guests enjoyed delicious Caribbean hors d’oeuvres during the cocktail hour. 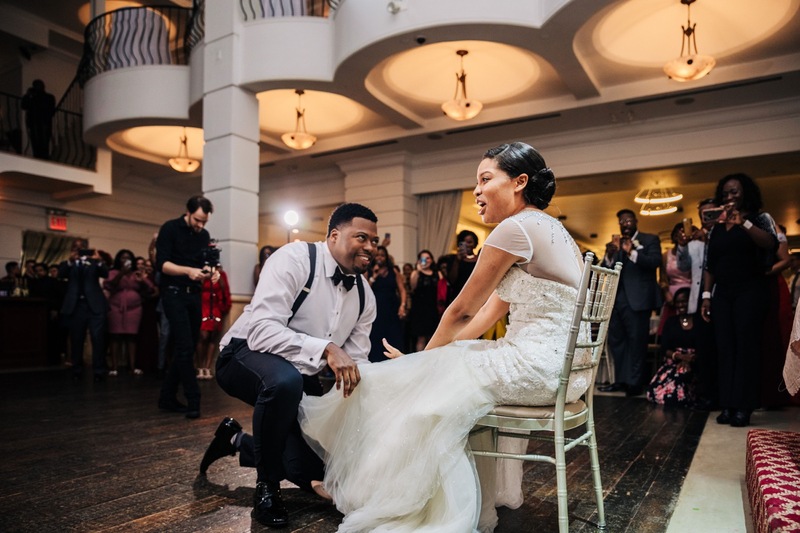 At the reception, the couple waltzed their first dance to “Best Part” (by Daniel Caesar feat. H.E.R) and watched a short video of the couple’s journey of love. The reception ended with a fun cake cutting and more dancing.